Summer is in the air, and along with it are the strains of music coming from outdoor concerts popping up everywhere you look. 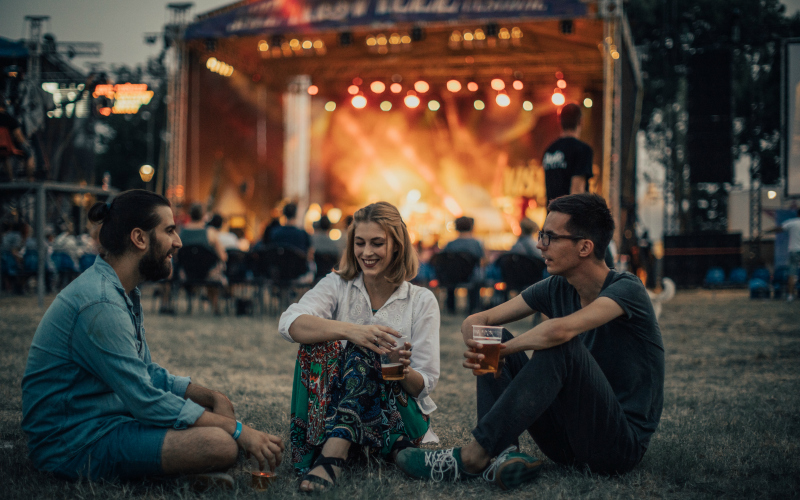 Spending an evening at a free music event put on by a museum, cultural institution, or even a shopping mall is one of our favorite summer activities. One notable absence on this summer’s schedule of free concerts is the classic Santa Monica Pier Twilight Concert Series. After outcry from some in Santa Monica, that series has been reduced in scale and moved to autumn, when they expect it will draw smaller crowds. The concert series at Skirball is free and all-ages, and includes a worldly mix of performers, several of whom you’ll probably recognize from the playlists on your favorite public radio station. Each show starts early, with an opening DJ taking the decks at 6:30 p.m. before the main show. We named this one our favorite museum after-hours programming, and it’ll only take one visit to see why. Take the sweeping beauty of the Getty Center, add a sunset, a refreshing cocktail, and a cool band, and you’ve got a perfect summer night. The summer after-hours programming at The Broad is a little different than some other museums–attending requires a paid ticket ($30) and is only for those 21 and over–but don’t let that turn you off, because these are some of the best and most interesting events around. Curated by James Spooner, Brandon Stosuy, and Ryu Takahashi, the Happenings feature music, film, and performance that connect with art on display in the galleries to create an immersive experience, and never shy away from the unusual or underground. Friday night jazz at LACMA is the best-known of the museum’s music series, but it’s not the only way to catch a concert. In addition to that lovely week-ending tradition, try coming back for Sundays Live, a chamber music series, and the Saturday night series Latin Sounds. Other Summer & Free Concerts in L.A. The popular public radio station curates this series of free, all-ages, ticket-free concerts at outdoor venues across the region. This year, the programming leans heavily on KCRW’s own DJ talent, but there are several nights with live acts, and more surprises to be announced. If you prefer your free concerts to feel like a rad band just happens to be playing in your coolest friend’s backyard, this summer daytime series is for you. The Arts District club opens up their outdoor space for 3:00 p.m. shows on Saturday afternoons. The concerts are free, but online RSVP is suggested. Eclectic and global, Grand Performances gathers the crowd around a manmade pond in the center of California Plaza in downtown L.A. The programming includes concerts as well as dance, storytelling, and family entertainment. 6/6: “Good Things Happen When We Speak Up: Stories From the Front Line” and L.A. Dance Party U.S.A. The DTLA shopping complex becomes a concert hall on June nights with live music and DJs. Before and after the show, you can hang out in a beer garden and play some lawn games. So summer. 6/8: Lion Babe, Dave B. The Sunset Marquis hotel has been a discreet retreat for rock-and-rollers since the glory days of the Sunset Strip, serving as the temporary crash pad of everyone from Led Zeppelin to Black Sabbath to Blondie. They honor that tradition with a free, public summer concert series, with bands set up next to the glam swimming pool. 8/3: Ilsey Juber, Andrew Cole & George Pajon, Jr. It may not be the Hollywood Bowl, but the Hollywood & Highland Center holds its own as a summertime destination with this outdoor jazz concert series. The programs is curated by KJAZZ 88.1 and Rum & Humble, and if you make a $14 donation to charity partner Project Angel Food, you can enjoy your music in a proper chair with wine and cheese service provided by Wolfgang Puck Catering and One Hope Wine. The Levitt Pavilion summer lineup includes 50 free concerts from June to September. That leaves room to represent an eclectic mix of styles and genres, with something to appeal to all. Performances take place on an amphitheater stage with an open dance area up front, surrounded by a grassy area for blankets and picnics (skip the wine though; this is a kid-friendly, booze-free venue), ringed in with lush trees and great sunset views. Within the grounds of North Hollywood’s Garland Hotel lies an entire park, typically used for private events. But on select summer nights, it’s opened up to the public for a free summer concert series. While the shows are open to all, capacity is limited, and an advance online registration is required to attend. This ticketed event series at the S. Mark Taper Foundation Ampitheater tucked amid the trees in Coldwater Canyon Park isn’t free–tickets will run you $12 to $20 for most shows–but the money goes entirely to support the local nonprofit TreePeople, who not only care for the park itself, they also provide tree plantings and environmental education around L.A. Enjoy skyline views from Hotel Indigo’s 18 Social penthouse lounge, while enjoying summer free concerts. The weekly series features local musicians, food and drink specials, and all the ‘gram-worthy sunsets you can handle. BOA’s West Hollywood steakhouse becomes a jazz club, so you can enjoy some live music along with your dinner and drinks–and put off the ultimate easy-yet-swanky date night.